$1.1 Billion was paid out to consumers 2001 from the funds derived from the proceeds of the initial PPA auction and an additional $1 Billion from the subsequent sale of shorter term financial swap contracts associated with the PPAs held by the Balancing Pool in 2002. From 2002-2005 the Balancing Pool operated on a break-even basis. From 2006 to 2016, the Balancing Pool paid out an additional $2.6 billion to consumers via the consumer allocation. The following table lays out the rate at which consumers were rebated and the total dollars paid out by the Balancing Pool. Following the PPA terminations in 2015 and 2016, the Government of Alberta enacted changes to the Electric Utilities Act in December 2016 that allow the Treasury Board to make loans to the Balancing Pool at the recommendation of the Minister of Energy and to guarantee the Balancing Pool’s obligations. 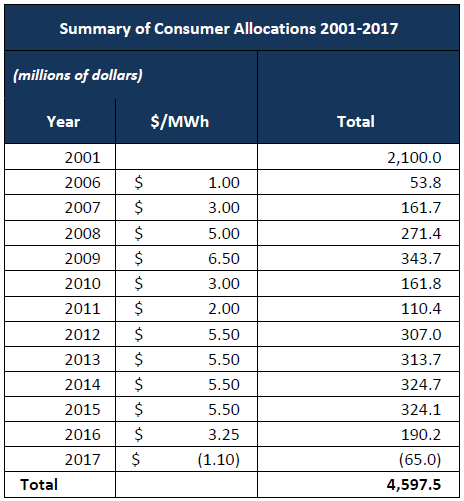 The Government of Alberta also enacted changes in 2016 to the Balancing Pool Regulation that stipulated the Consumer Allocation for 2017 at a rate of $1.10/MWh for an estimated annual collection of $65 million.